La Flor Dominicana introduced a slew of new cigars at the IPCPR trade show in New Orleans, including a new Brazilian-wrapped cigar, a revival of the Coronado blend and a special-edition Salomon Especial, along with other line expansions. The majority of these new releases are set to arrive at retailers in mid- to late-August. The most significant of the La Flor releases was the new La Nox cigar, which features a Brazilian Cubra maduro wrapper, Mexican San Andrés binder and a filler mix of Dominican Piloto and Pelo de Oro tobaccos. This dark smoke, which will ship in boxes of 10, was released in one size only, a 6 1/2 inch by 50 ring gauge Churchill. La Nox will retail for $11.00 per cigar. Coronado by La Flor, Cigar Aficionado's number two cigar of the year in 2006, returned to the La Flor lineup under a new name, LFD Coronado. However, the critically acclaimed blend—all-Dominican fillers and binder draped in a Nicaraguan Habano wrapper—remains the same. In a conversation with Cigar Aficionado, Litto Gomez, co-owner of La Flor Dominicana, revealed this was the release he anticipated most. The cigar comes in five sizes: Double Toro, 7 inches by 54 ring gauge; Corona Gorda, 7 by 60; Double Corona, 7 by 50; Corona Especial, 5 3/4 by 47; and Toro, 6 by 52. LFD Coronado will ship in boxes of 18 and will retail from $8.80 to $10.50. In addition to the Coronado blend, La Flor has revived its special-edition Salomon Especial. These smokes, which come in trapezoid-shaped boxes of 10, now include a thin ribbon of Ecuadoran Connecticut wrapper around the tapered foot and cap. The blend remains consistent with the previous edition: vintage Dominican fillers and binder with a Habano wrapper. The Salomon Especial will retail for $25.80 per stick. La Flor has also expanded two of their previously existing lines, adding a new size to its 1994 line and a darker shade to the Air Bender. The 1994 line expanded to include a 4 1/2 inch by 48 ring gauge robusto, dubbed Tango, which will retail for $6.80 per cigar. Like the rest of the 1994 line, Tango consists of Dominican fillers and binder with a Mexican San Andrés wrapper. The Air Bender received a darker wrapper, as three sizes from the original line—Matatan, measuring 5 inches by 50 ring with a suggested retail price of $7.60; Chisel, 6 1/2 by 54, $9.20; and Valiente, 6 1/4 by 60, $9.00—are now available in maduro. The blend, all-Dominican binder and filler with an Ecuadoran Habano wrapper, remains the same, and Air Bender Maduro will ship in boxes of 20. 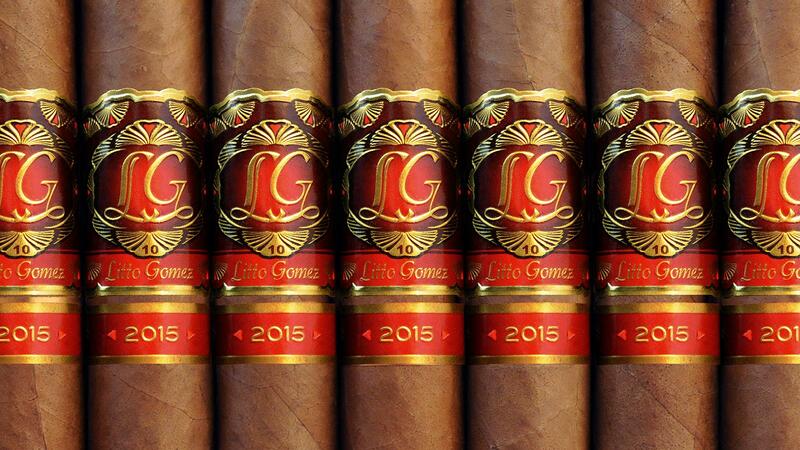 The Litto Gomez line received a 2015 revamp with a new blend deriving from a single crop of vintage tobacco grown at the La Flor farm in La Canela, Dominican Republic. These special smokes will ship in boxes of 20 and come in five sizes: Oriental, 4 7/8 inches by 38 ring and retailing for $8.80; Cubano, 5 by 50, $11.20; Chisel Puro, 5 1/2 by 54, $12.80; Americano, 5 3/4 by 46, $11.20; and Lusitano, 6 by 52, $12.80.